The Japanese games that tend to make a splash in the U.S. market are those with zany themes and components. Games like String Railway, Gra Gra Company, and Magical Athlete are the ones that get people’s attention. But I’d like to draw your attention for a moment to two excellent Japanese card games that are neither wacky nor well-known. They are Dazzle and Khmer, both released by the publisher Saien in 2010. Both are two-player card games and each takes roughly 20 minutes to play. I’d consider them in the same vein as games like Jaipur, Biblios, Lost Cities, Odin’s Ravens, and the like… except that far fewer people actually own them or are even aware of them. I’d like to do what I can to rectify this by explaining what you’re missing by not having these two gems readily available. Game Play. 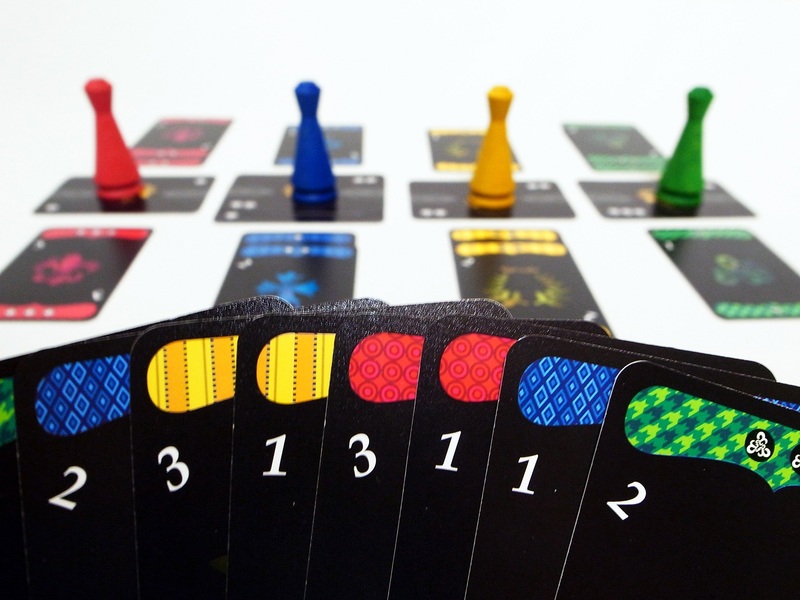 Dazzle is played with a deck of 48 cards in four suits (Red, Yellow, Green, and Blue) with cards ranging in value from 1 to 3. Before the game begins the deck is divided in half through a slightly funky method such that each player has the same number of cards of each value in his or her stack. The players each draw 8 cards from their stack into their hand. On your turn you pick any 2 cards from your hand to give to your opponent face up. Your opponent then selects one of the cards to add to the VP value of that card’s color and the other card to add to his or her own strength toward winning that card’s color. You then refill your hand back up to 8 cards and go back and forth until all cards have been used in this manner. An example may be in order because it’s very simple and intuitive, but a bit tricky to explain. If I choose a Red 1 and a Blue 2 from my hand, then I give them to my opponent. Let’s say my opponent chooses to add the Red 1 to the VP value of the Red suit and to add the Blue 2 to his or her own strength toward winning the Blue suit. At the end of game you sum up all of the cards that have been allocated to the VP value of each color to determine each color’s worth. So while Red might be worth 5 points, Green could be worth 8 points for instance. Then you sum up each player’s strength in each color. So I might have 7 strength in Red and you might have 6 strength in Red, so I would win the color and all of its points. You figure out who wins each color and the winner is the person who earns the most points obviously. The way each color is worth a different amount and the scoring works in the end is vaguely reminiscent of Biblios (a.k.a. Scripts & Scribes). Review. Dazzle is excellent because it is 20 minutes chock full of agonizing, difficult, and meaningful choices. It also has plenty of room for clever play and really requires you to think hard about what your opponent is likely to decide. You can pair the cards in your hand up in many different, interesting ways as you offer them up to your opponent. And you’re constantly surprised by how your opponent decides to use the cards you offer. 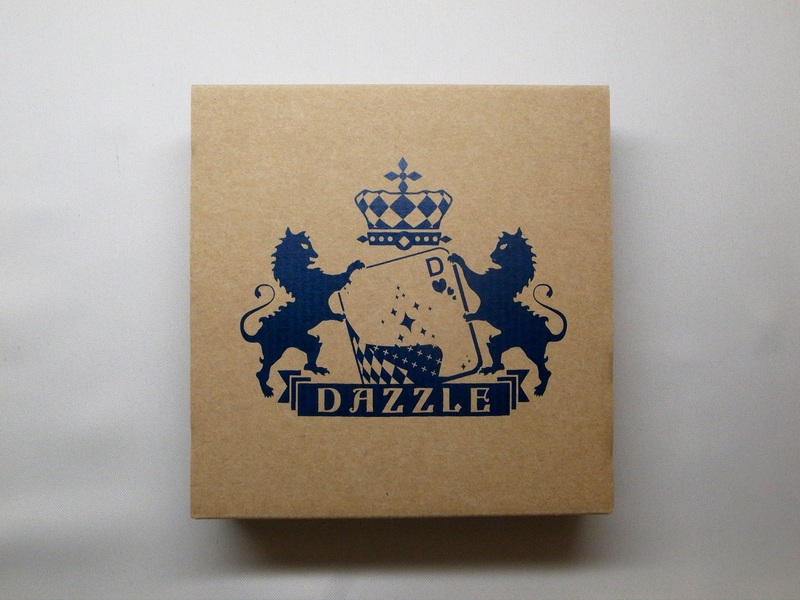 I’ve played Dazzle 7 times so far and would rank it right up near the top of 15-30 minute two-player card games. Game Play. 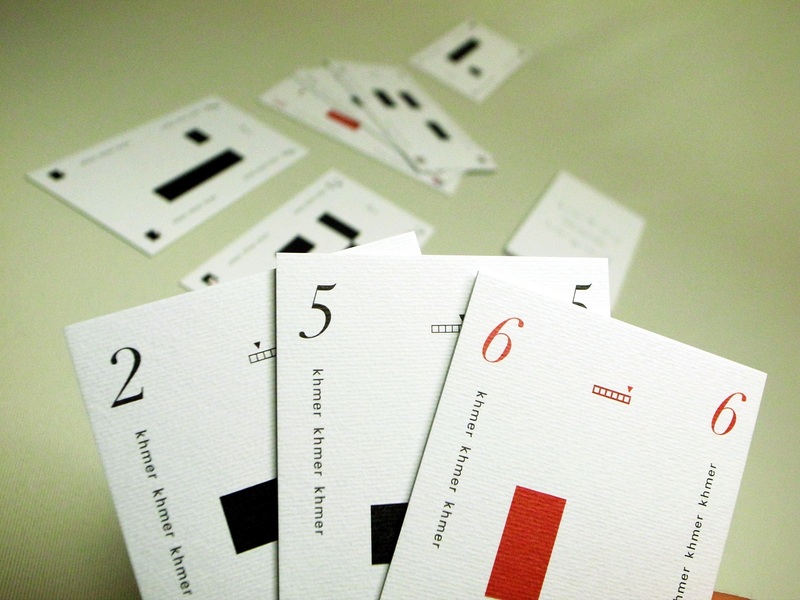 Khmer is played with a deck of 16 cards (although the cards are more like cardboard placards with a very nice aesthetic design and feel to them). The value of the cards range from 1 to 6, with two of each value, except there are six 6’s. You begin the game by randomly removing four cards from the match face down so that neither player knows what cards are out of play. Then you deal all of the remaining cards out so each player has a hand of six cards. Fold to forfeit the round and let your opponent have 1 VP. Again, an example may be in order because it’s simpler than it sounds. Let’s say you are dealt a 1, 2, 2, 4, 5, 6. So the total value of your hand is 20. You go first and play a 2 to the table, then your opponent plays a 6, then you discard your 6 from the game, and your opponent plays a 3 to the table. Now you’re left with 1, 2, 4, 5 so your total value is 12. Face up on the table are a 2, 6, 3 so the total table value is 11. You wouldn’t knock because your hand value is still above the table value. You could play another card to the table or you could pick up the 3 and add it to your hand. This would continue until one player knocks or someone folds. If someone knocks then both players reveal their hand. The player with the highest sum that is less than or equal to the table value wins the round. On a tie then the knocking player loses the round. The winner then receives 2 VP. The game is played to 6 VP, so you then shuffle up all the cards and go again. This scoring system is somewhat reminiscent of the doubling die in Backgammon because you can forfeit a round to guarantee your loss but give fewer points to your opponent. Review. Khmer is even more of a psychological game than Dazzle. You need to try to read your opponent and figure out what’s going on in his or her head (like Piranha Pedro but without the drowning). It also helps to be able to do a bit of simple arithmetic on the fly and to keep track of the cards, especially if your opponent picks any up off the table. I’ve played Khmer 5 times so far and while I don’t think it’s quite as excellent as Dazzle, it still manages to pack an impressive amount into a game with such simple components and rules. Khmer is rather remarkable for all that it manages to do with so little. It’s unfortunate that Dazzle and Khmer are not more well-known and more widely played. Given the popularity of simple, quick two-player card games like Lost Cities, I think that both of these games could really be hits if given the opportunity. If that niche is something you’re looking to fill and you have a chance to play or pick up either, then I heartily recommend doing so. Saien has a pair of gems on their hands in Dazzle and Khmer just waiting to be discovered by adventurous gamers. These sound absolutely brilliant! What may be keeping them from wider release, however, is that they both could be played with standard card decks (several of them, of course). And, of course, two-player-only card games are a hard sell. Still, hope they get their own versions. Thanks for introducing them to us, Tom! Where can I buy either one of these? If I google it I cannot find a vendor and the company website is in Japanese. I was introduced to them by a friend who lived in Japan for a while, Ted. He got them directly from the publisher. I asked him to post here when he gets a chance about where/how you might be able to track down copies. I think you could also get them at Essen, if you go, by e-mailing the publisher ahead of time. I realize this review is a bit frustrating since the games aren’t readily available, but my main hope is to do whatever small part I can to theoretically make them more widely available by seeing if I can generate a bit of interest in them. Hello, I am Tom’s friend from Japan who introduced him these two games. The game is available from Sugorokuya in Tokyo but they don’t ship overseas. 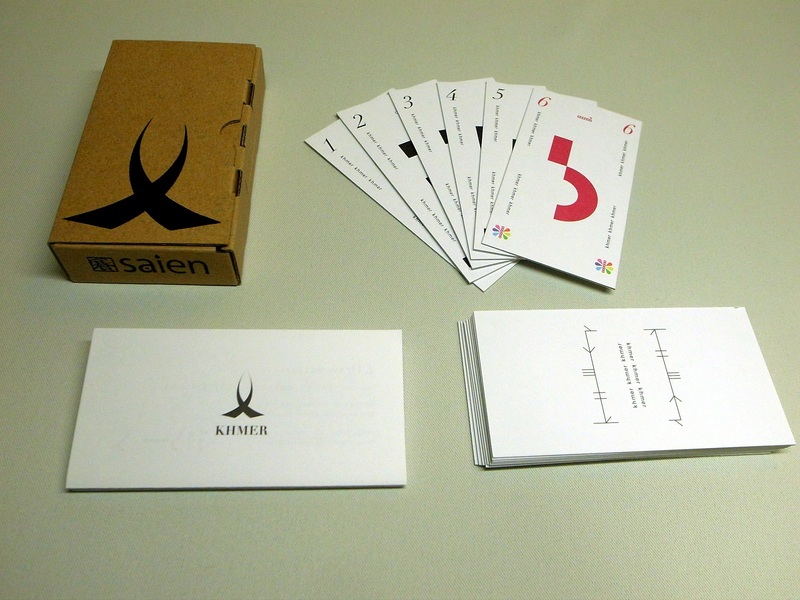 It is also available directly from Saien. I asked people from Saien and they gave me this e-mail address. However, they are not too good at English, so please write to them in “simple English”. Hi Tom and Ken. These really sound like to little 2-player gems to me. However, I have one question: There is one discrepancy between the english (and german) inofficial rule translation for Khmer in the BGG files sections and the review posted on this page. Could you tell me which rule is the right one? In addition the BGG translation mentions that cards played in front of a player are separated from his hand and can neither be played nor discarded.